Sewers? Reminds me of the River Of Slime. In any case this is another alt stage sort to speak. Alt meaning a stage that I have to create aside from the original Beta Stages because there wasn't enough made originally. Example: The Clock Tower I made. I am going to try and "Skin" the Dragons for this boss into skeletons instead of the original versions. The way Dry Bowser is to Regular Bowser. Note - I will be editing the Floor Tile. Right now it looks a little to Dracula's Curse. From what I recall there was some screenshots or some sort of sprite work on some areas for Cadence of Agony floating around like the catacombs, underground caverns and something else (which I can't remember) that you could probably use for references to make other areas within the ROM. Would be a place to start with if you haven't got the idea already on your plate. Also, still no word back on the C3 information. I'll give it a couple more months and try one more time. Excellent, The most recent sprite I could use help on is skinning the twin dragons boss. I figure them being skeletons would go well in a river of blood as seen above. I'll also need Syfas Portrait converted into Maria's as well as Grants turned into Armunds. Optomon contacted me and said he would install the original custom music as well as possibily removing the forks in the road so all stages are playable from beginning to end. But more the music which is a must in this project. I have been referenceing the screenshots from You Tube where optomon put the soundtrack with an image from the game. The stage graphics are all there. The only stage I can't seem to find in the Rom is the library. It's probably there but never easy to see when scanning with YY-CHR. Oh, The Rom it's self is expanded. I expanded the CHR so I could add stage graphics to the end of the rom. This protected the Prayer Scene graphics from getting messed up as Stage One was edited. I'll look at the CoA ROM later tonight to see the art style he was going for as its been a heck of a long time since I last looked at it. I'll make a few samples in the next couple of days in his art style depending on how busy I'll get but I'll definitely get you something made for what you are asking. When I'm done where can I post this up at or send it to so you can view it? Also, want me to do this with the sprite's current color palette or just a custom one to see stuff for what it is? Which level will the library be? I could look into recreating this within that section once I find the reference Optomon has out there. I can make two sprite references, one for the YYCHR and the other a sprite sheet explaining on what is what with everything separated so you can edit or do whatever needs to be done to put into the game. Nah, it would be easy to edit the Trevor sprite into Richter for the prayer scene. Just let me know on what you want with how or what animation you'd like to see him to rise up into for a stance within Trevor's sprite frames. I know its a limited space but I'll get ya something made. 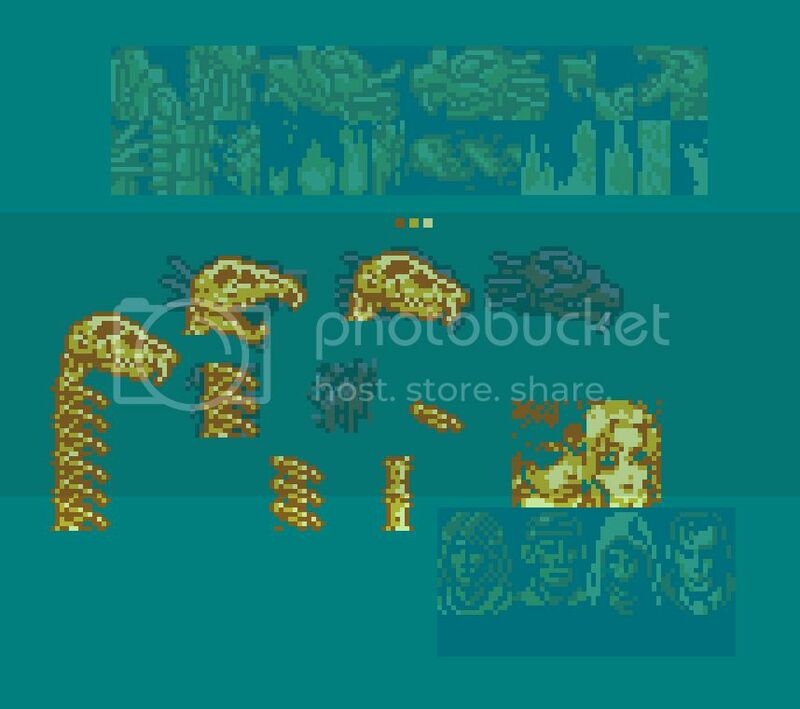 Probably best to get the easy stuff out of the way first like Richter Sprites (Prayer/Ending) and Armand/Maria Portraits. The CV3 Rom is like an artificial intelligence that loves to fight me when I work on it I swear. Lol. One tiny mistake in it's coding or something and BAM, I have to do the whole stage over. Speaking of Sprites, I am having trouble getting the hands to match up when Richter shakes the hand of the other character. Alucard was easy but everyone else giving me hell. He even had Sword Animation planned for Alucard. WOW! This is one hell of a pair of shoes I have stepped my feet into. Instead of get up and moving his cape maybe you could make Richter give a peace sign instead. Probably add a heart above his head. Also, make him wink 1 eye if possible. Working on two stages at the same time. Here is an image of another stage, this one is the first to be designed based on a picture. After 4 Hours of straining, it's break time! The original fire sounds good. Small update on my end. People are probably wanting an update on the sprites so here you all go! Sephirous has the exact sized sprite sheet as he can tweak things to what he sees fit for adjustments and hopefully the YYCHR sprites fit accordingly as I didn't test them in a spare ROM for the twin water dragon boss. I hope this is somewhat close to the art style that Optomon had going especially the portraits because I can't find any boss pictures besides the Dracula one that him and Dr. Mario(?) were working on. Took me a bit to do them from scratch compared to the original size that they were drawn in. Dunno if they seem butchered in some way but I feel confident with presenting them to Sephirous lol. Thanks to Sinis for his wonderful contribution. We now have Bone Dragons! Originally I was going to make them white, However this messes with the Candles colors and didn't look so well. But it just so happens the Blood Skeletons use these colors so why not the Bone Dragons? They are in blood after all. Editing the boss sprites opens lots of cool doors, perhaps other bosses can be modified as well. But for now here is what we got! Note - The bricks are going to be changed. Right now they look just like the CV3 ones. I'll probably convert them using something that is in the Abandoned Rom that doesn't have a complete stage. Stage 4 has two parts now, The Hallway was implemented into the middle of the stage. Note - This stage is complete. I'm going to start being more Non Spoiler with the later stages, otherwise the game won't be as anxious to play. Don't worry I will still upload pictures just not screen to screen. The Original Bone Dragon beta sprite has been revived. Next is more work on the blood river stage, the platforms have to be upgraded. The next stage I will attempt is probably going to be the hardest to complete which is the chapel. The detail that Dr. Mario and Optomon put into that stage is incredible and it will probably take hours of straining the eyes to get it right. But It will get done one way or another. Awesome, someone actually decided to finish Cadence of agony. As much as I'd like it to be non-linear as it was intended, I'm really happy to see a sequel to Chorus of mysteries. Sephirous, I hope you can do it justice. I'm interested in helping with spritework, so if there is something that isn't taken for me to work on, I'd be happy to know. I know it's not perfect by any means but with a bit of a work these can look good. (also, ignore most of the palettes for Simon, these are placeholders if I ever decide to finish him). Sprite editing is one of my weaknesses so any help will be great! As of right now I am trying to finish the stages first. Boss Sprite upgrades would be cool. Off hand I can't think of very much yet, I have cool idea for a better Title Screen but getting it from my brain to the game is impossible at the moment. Dracula's Final Form I am hoping will be the unused one that Dr. Mario created. Its the same Statue idea but meaner looking. Another thing I am trying to do is convert the very first castle screen in the prologue into the Konami Logo. I have searched the roms hex for hours and nothing seems to match the graphics for that image. Oh and to convert Dracula's First Form into the Rondo looking one. Is Alucard boss being worked on? I'm thinking into making him into Orlox (which might be impossible since Armund defetead him few years ago) or maybe other vampires from the series (of course if you agree). If not I'll pick up something else. Also how do you want me to send my stuff (I'm not sure if you want it to be public)? If you're wondering what to call your next castlevania game. I'd got with Castlevania - Hip Hop Hurrah. Noones used hip hop in a castlevania name yet. You could make it the 1999 game since hip hop existed then. Alucard has to remain Alucard because he is still going to be met after Richter defeats him. Ok then, I've started doing Dracula's first form and I'll probably finish it until Saturday, it really depends on school and my free time. About Alucard, I understand that you are still meeting him ,but it's kind of hypocritical of him to kill just to see if someone is fit to help him fight Dracula, yet he despises Dracula for killing humans. But it might be just me though. Speaking about bosses. Hey Sephirous, an idea came across me this morning. Why not redo Medusa into the version that is seen in Rhondo of Blood? If it sounds okay with you I can start working on that once I get the prayer and ending sprites done that we talked about. I just got some time to myself to begin working on them off and on this week and into next lol. This is looking great, I love seeing the progress on this hack.